As you’ll no doubt be aware, the planning application for Peel Waters was recently waved through by Eric Pickles, Secretary of State for Communities and Local Government, and there will be no public enquiry. Regular readers will remember previous posts, where I’ve come down against the scheme. But now that it looks like going ahead, it’s time to move on and consider how the development will unfold. One thing I want to state up front is that I am not against regeneration in historic areas. In fact, to let old buildings get in the way of new use is suicidal from a heritage perspective, and just provides fuel to those who are set to profit from unnecessarily demolishing the old and building anew. The area Peel want to redevelop is not only derelict, but generally free of historic buildings, and Peel have also commissioned an Archaeological Deposit Model – an assessment of the archaeological potential of the area. Having been a professional archaeologist for a time, I’m comfortable with the ‘developer pays’ model of preservation by record when new developments take place on land previously occupied by any number of phases of inhabitation. So I’m not worried about what will be removed, or destroyed. I’m not worried about what will get demolished or dug up or thrown out. I’m concerned about the landscape of Liverpool. And it’s not just the ‘historic landscape’, which seems to furrow brows in UNESCO. It’s the landscape character of Liverpool, of which historic buildings are just one part of. I want to discuss the two types of artists impressions that have been circulating, and about the two routes this development could go down. 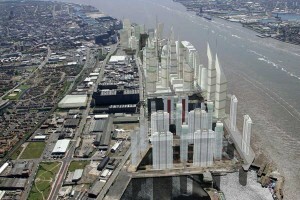 These will have very different impacts on the Liverpool landscape. The first impression is full of skyscrapers, crazy windmill-powered buildings and the ‘tallest structure outside London’. 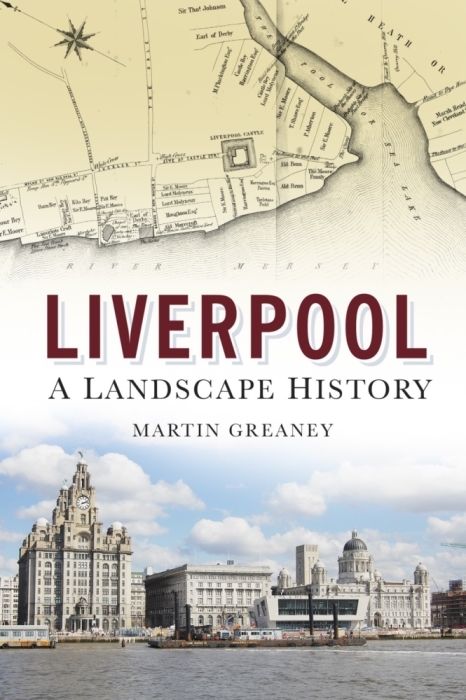 Does this in any way reflect the current Liverpool landscape, historic or otherwise? 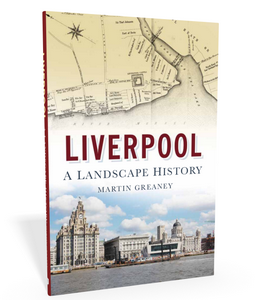 What about the landscape of the Wirral? 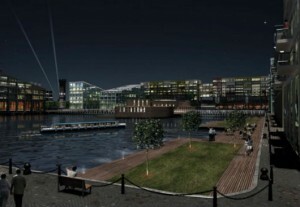 The second impression looks more like a marina, or a modern version of the Albert Dock. Buildings are around as tall as the Three Graces, or the hotels around the Kings Dock. They are interspersed with water and boats, and you’d be forgiven for thinking they were already out there, somewhere between the Garden Festival site and the Echo Arena perhaps. They are modern, they are new, they replace empty space, and yet they are undoubtedly ‘Liverpool’. In short, I hope that the developments in the north docks reflect the landscape into which they are newcomers, because I’ve seen evidence that Peel are including this type of structure in their scheme. The other point I want to make, partly in support of the above position, is that we have been through a period, not so long ago, when the city was in a similar position to what it’s in now. It was a time when austerity had bitten hard for many years, and unemployment was a huge problem. The government of the day had high hopes for the coming years, however, and made bold attempts to solve employment, housing and other social problems through ambitious building schemes. And for the first time in history, technology was of a level where these grand visions could be made concrete, in an all too literal sense. The 1960s gave us many great things, but architecturally it was a disaster. We came away with the Piggeries, the Kingsway Tunnel entrance, and Concourse House. One of the characteristics of the last three decades has been for the pulling down of brutalist office eyesores from the Strand to Lime Street, and for the demolition of unloved and unsafe social housing tower blocks. What were they replaced with? Low rise housing and more imaginative glass and steel structures. While we’re past the age of wide use of beautiful but unsustainable building stone, our modern architects have shown, through schemes like Liverpool One, that variation, decoration and a human scale can combine to create something that, though having its fair share of criticism, has created a central, open air, pedestrian-friendly shopping landscape which not only fits in with Lord Street and Church Street, but also rejuvenates historic thoroughfares like South John Street which had become little more than a derelict wasteland after the last building glut. Of course, that pesky market! The second point is also related to the construction landscape of the city. Peel envisions the project taking 30 to 50 years. Half a century! Even if there was a unanimous agreement with the scheme as it stands, what will that scheme look like in 10, 20 or even 30 years? Relevant? Probably comical. If history has shown us one thing, it’s that attitudes, fashions, and technologies change, they move on. It’s a concern that one company has a monopoly over a prime development area, and is trying to make decisions now which will affect it for decades. The regeneration scheme I’d like to see would therefore have two characteristics. The primary one is that it would take its inspiration from the great and varied projects of recent years: Lime Street Station, the Echo Arena, the Baltic Triangle, Kings Dock, Liverpool One and the Museum of Liverpool. These buildings are extensions, modernisations of the Liverpool landscape, not impositions of it. You may not agree with the architectural merit of all of them, but they can be judged as buildings within the landscape, not as a landscape in themselves. Secondly, I’d prefer to see Peel open up the area for varied and sensitive development as it is needed. Perhaps this needs to be kick-started with a group of speculative buildings – it worked for the India Buildings and other Victorian gems – but a gradual approach to developing the landscape is one which will pass the test of time. 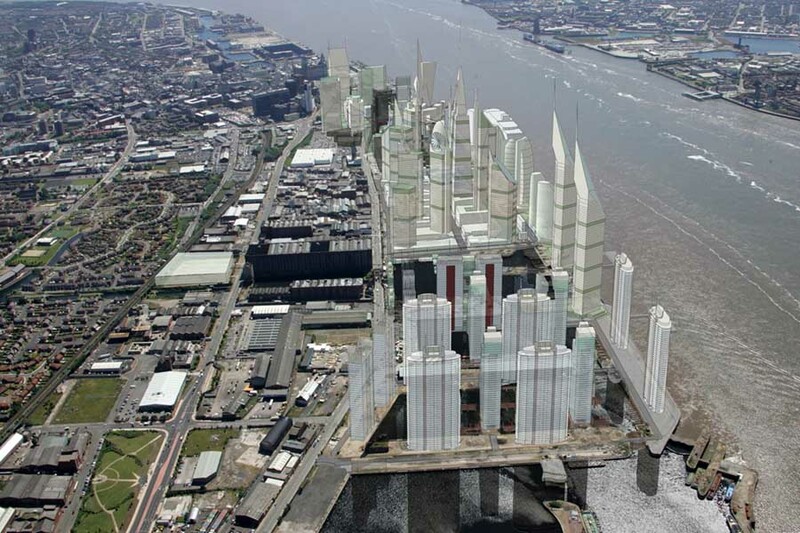 To alter the balance and scale of Liverpool’s urban landscape with a scheme which has no sense of place or time is to forget the problems of similarly ambitious and rushed ideas – problems which are taking us years to fully rectify. Any scheme like Peel Waters will have effects on the landscape. I hope they are ones which our descendants will thank us for.